Towards the south of Dubrovnik is the coastal town of Cavtat, which is in fact the most southern town in the country. It is ideally located on the edge of a beautiful bay and although the town is relatively small compared to cities like Dubrovnik, it still has a good selection of things to do and we are sure that you will appreciate the lush greenery that covers the surrounding area. Take a swim in the beautifully clear sea, enjoy a spot of sunbathing on the sandless beaches, which are ideal if you hate getting sand everywhere. Why not cool off in the water and see historic sites beneath the waves by diving to the bottom where you will find Roman shipwrecks. There are also many attractions, which includes the fascinating Collection of Baltazar Bogisic featuring valuable items and the Racic Family Mausoleum, who were a prominent shipping family. If you enjoy walking, you won’t be short of places to wander to but don’t forget to visit the local restaurants to get your energy up and when the sun goes down, there are even places to have a dance! Made from beautiful Brac white stone, the Mausoleum is where you will be able to experience a sense of life and death. This may sound a little eerie but it is quite the opposite. It is an important piece of history of the Racic Family and an impressive piece of architecture created by Ivan Mestrovic, the famous Croatian sculptor. Ivo Racic was a ship owner and captain who died in 1918 followed by his family a short time after. Vlaho Bukovac was a famous Croatian painter who was born in 1855 in this very house, which has since been named a cultural monument. It may not appear to be anything special from the outside but it’s well worth appreciating if you are a fan of his work or fine paintings in general. You don’t always have to be an explorer or an artist to accumulate a collection of valuable and interesting items, which is what makes lawyer and scientist Baltazar Bogisic so interesting. With over 35 thousand objects in the collection and one of the most valuable monument libraries in the country, it really can’t be missed. There are some top swimming spots close to the town, as the water is easy to get to all the way along the bay. There is also a selection of fantastic water sports. How about hiring a motorboat or a kayak? Or maybe just go for a relaxing swim in the water or splash with your friends to cool off under the sun. If you want to see a different side of Cavtat then why not venture beneath the surface of the waves on a diving trip! If you don’t know how, you can learn and seeing the wrecks of old Roman ships makes for an epic dive. If you fancy something a little more laid back then book yourself onto one of the boat trips or go for a fishing trip off the coast and see what you can catch. This is not only a great way to relax but the perfect way to see the beautiful coastline from the water. Hiking In the southern region of Croatia, you will find many lovely country trails where you can spend you days exploring the area on foot. It’s great for hikers but also casual walkers, as there aren’t very many inclines along certain trails but if you’re feeling brave, you can always explore a little further a field. 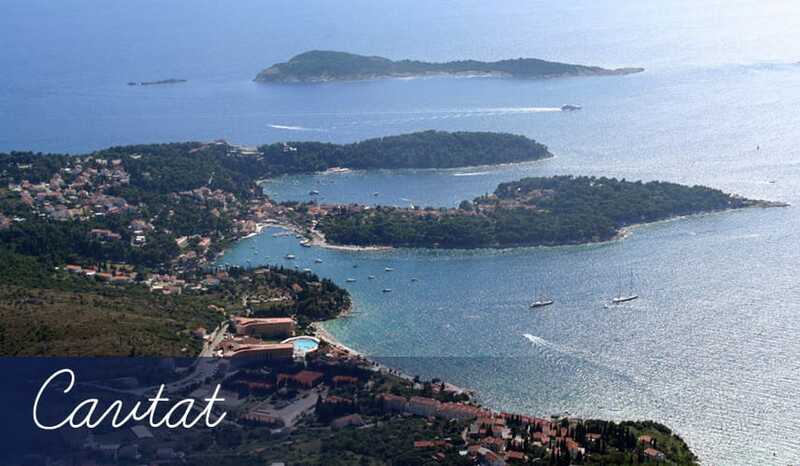 Although you may not expect to find sandy beaches in Cavtat there are still many coastal areas where you can relax. These are mainly concrete beaches that have been constructed, offering you a safe, flat surface to sunbath on and there are also rocky parts of the coastline that you can use as a sunbathing area. If you don’t mind travelling a little further north along the coastline you will come to a selection of other beaches including a nice sandy stretch that’s popular for those visiting Dubrovnik. Along the waterfront is where you will find many excellent places to eat through the day and into the evening. Whether you want to try some of the amazingly fresh, recently caught seafood or fancy a good old fashioned burger with a side of chips, there will be something here to suit your tastes. Best of all, the food is quite a lot cheaper than places like Dubrovnik and it’s a little further off the beaten track. This works in your favour very well, as it means you will be able to eat out more or save your cash for other things. Although Cavtat is designed for more peaceful holidays, you will still find a selection of cafes and bars where you can have a good time when the sun goes down for the day. Along the edge of the bay is where you will find a good majority of the bars, with most offering outside seating so you can enjoy the evening air and beautiful views across the water. Even when the music is playing, it’s still very relaxed and you won’t have to worry about rowdy crowds or over the top shows. It’s simple yet very entertaining with many opportunities for you to get up and have a dance. Alternatively, simply order your favourite drink and enjoy a quiet evening with stunning views in great company enjoying conversations with the people you love the most. A bit like the nightlife, within any small town there are a few small shops selling the essentials, as well as some unique shops selling items that you are sure to find quite fascinating. Fancy some Croatian wines? No problem. You will no doubt be able to find bottles of the stuff here for you to enjoy during your holiday or take home as a gift for someone very special. Or how about some truffle olive oils? These are some of the more unique items available in Cavtat and thanks to it being a small town with fewer visitors, you can expect to pay quite a lot less when compared with very popular resorts.